Premier Li Keqiang of the State Council will attend the opening ceremony of the Boao Forum for Asia Annual Conference 2019 at invitation on March 28 in Boao, Hainan and deliver a keynote speech. Prime Minister Thongloun Sisoulith of Laos, Prime Minister Xavier Bettel of Luxembourg, Prime Minister Jorge Bom Jesus of Sao Tome and Principe and Prime Minister Lee Nak-yon of the ROK will attend the annual conference at invitation. Q: The Canadian canola council has said that Chinese importers are unwilling to purchase all Canadian canola seed at this time, not just canola seed from Richardson International. Canadian agricultural goods are facing strict customs inspections and this is causing the cancellation of purchase orders. Can you confirm that this is happening and is this a form of economic retaliation against Canada? A: My colleague answered similar questions last week. The General Administration of Customs of China has issued relevant notice regarding this. I don't have any new information. 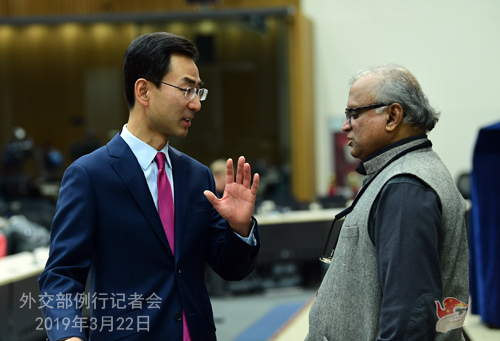 One point I would like to stress is that it is the bound duty of the Chinese government to protect the safety and interests of Chinese consumers as well as China's agricultural production and ecological security. Quarantine measures taken by China's customs are normal and for safety precaution. They are legitimate, reasonable and in compliance with Chinese laws and regulations as well as international practices. Q: According to media reports, US President Donald Trump tweeted on the 21st that "it is time for the US to fully recognize Israel's sovereignty over the Golan Heights, which is of critical strategic and security importance to the State of Israel and regional stability". Israeli Prime Minister Benjamin Netanyahu expressed his thanks to President Trump over a phone call. An EU spokesperson said that the EU's position on the sovereignty of Golan Heights has not changed and that it is not considered part of Israel's territory. What's your comment? A: UN Security Council Resolutions 242 and 338 have clear provisions on the occupied Arab territories including Golan Heights. It is China's consistent position that parties concerned should abide by relevant UN resolutions and norms of international law and properly handle territorial disputes through negotiations for comprehensive, just and lasting peace in the Middle East. Q: Reports say the US Treasury announced that it will impose sanctions on two Chinese companies which, according to its words, helped the DPRK to evade sanctions. What's your comment? A: China has all along been earnestly and strictly implementing all DPRK-related resolutions adopted by the UN Security Council. Chinese entities and individuals, once found involved in activities in violation of Security Council resolutions, will be punished in accordance with China's domestic laws and regulations. Meanwhile, we firmly oppose any country imposing unilateral sanctions or "long-arm jurisdictions" on Chinese entities in accordance with its domestic laws. China has lodged stern representations with the US. We urge the US side to immediately stop its wrong action lest it should affect the cooperation between the two sides on relevant issues. Q: A lot of attention has been drawn to the recent tropical cyclone that has caused major casualties and property loss in Mozambique, Malawi and Zimbabwe. 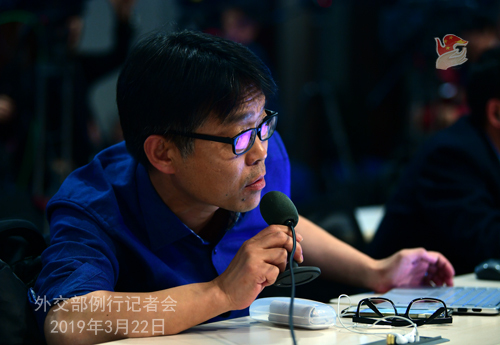 At the press conference on Tuesday, you said that the Chinese government will support and assist in their disaster relief efforts as its capability allows. Could you give us more details about what China will do to assist them? A: China has been closely following the great casualties and property loss caused by the recent tropical cyclone in relevant countries. President Xi Jinping has sent messages of condolences to President Filipe Nyusi of Mozambique, President Emmerson Mnangagwa of Zimbabwe and President Peter Mutharika of Malawi. The Chinese government has immediately provided emergency humanitarian assistance to the government of the three countries and helped them with disaster relief and reconstruction work. The China International Development Cooperation Agency has issued a press release on this. Chinese enterprises and overseas Chinese in the three countries have also pitched in the disaster relief efforts by contributing manpower and making donations. China will give positive consideration to offering more manpower and material support as the governments and people of relevant countries need. Q: We noted that in the past couple of days, a series of activities of the second Lancang-Mekong week are taking place in regional countries as well as in the Chinese provinces of Yunnan, Guizhou, Sichuan, Guangxi, etc. Could you shed some light on the considerations behind these activities? What's your opinion on the Lancang-Mekong Cooperation? Do you have any expectations? A: In the second Lancang-Mekong Cooperation (LMC) Leaders' Meeting in January 2018, the week that March 23 falls in was designated the Lancang-Mekong week. In 2019, this week starting from March 18 to 24 is the second LMC week. 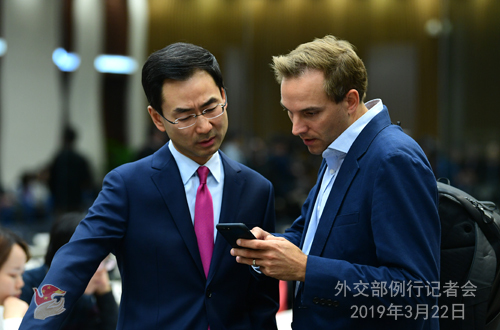 Based on my information, central and local governments as well as overseas diplomatic missions of China and the five riparian countries will jointly hold over 50 celebratory events of various kinds to mark the second LMC week. This, I believe, speaks volumes of LMC's unique appeal and rich outcomes and the six countries' strong commitment to cooperation. The LMC is the first new-type sub-regional cooperation mechanism established by the six riparian countries based on the principle of consultation and cooperation for shared benefits. Since its official launch in 2016, the LMC, staying true to the theme of "Shared River, Shared Future", has fully leveraged the six countries' geographical proximity, cultural affinity and economic complementarity and achieved fruitful results in institution building, practical cooperation and cultural exchange. People in the sub-region have reaped tangible benefits and bonds between the six countries have become closer, promising even brighter prospects. China stands ready to work with the riparian countries to develop an LMC economic belt and build an LMC community with a shared future for greater progress and prosperity in the sub-region. Q: Vietnam has lodged official protest with China following the sinking of a Vietnamese fishing boat, which it says was chased by a Chinese maritime surveillance vessel in a disputed district of the South China Sea. I wonder if you have any comment on this? A: Xisha Qundao is undisputed Chinese territory. We urge the Vietnamese side to immediately stop illegal trespassing and fishing activities in the internal waters and territorial sea of China's Xisha Qundao. As to the incident on March 6 the Vietnamese side mentioned, China has released information on it. The Vietnamese fishing boat had already sunk after hitting a reef before the arrival of China's coast guard vessel. We hope Vietnam will not twist the facts. Q: On next Tuesday President Xi Jinping will meet with the French President Macron and the German Chancellor Merkel when attending a forum. Do you have more details? A: During President Xi Jinping's visit to France, China and France will jointly hold the Global Governance Forum, inviting people from all walks of life from China, France and the Europe to exchange views on a wide range of issue including upholding multilateralism and the multilateral trading system, improving global governance, addressing global challenges and jointly building the Belt and Road. President Xi Jinping will attend the closing ceremony of the forum along with French President Macron, German Chancellor Merkel and European Commission President Juncker and deliver a speech. State Councilor and Foreign Minister Wang Yi will attend the opening ceremony of the forum together with French Minister of Europe and Foreign Affairs Jean-Yves Le Drian. Q: According to media reports, the US State Department released its annual Hong Kong Policy Act Report. Do you have any comment on that? A: Since Hong Kong's return, the policies of "one country, two systems", "Hong Kong people administering Hong Kong" and a high degree of autonomy in Hong Kong have been earnestly implemented and Hong Kong people's rights and freedoms have been fully guaranteed. The Chinese government's resolve to handle all matters in strict compliance with the Constitution and the Basic Law and to fully and faithfully implement the policy of "one country, two systems" will not change. I want to stress that Hong Kong is a special administrative region of China and Hong Kong affairs are purely China's domestic affairs. No foreign government has the right to interfere. The US report finds fault with Hong Kong affairs and wantonly criticizes China's central government and the Hong Kong SAR government in disregard of facts. We deplore and stand resolutely against it and urge the US to stop such erroneous practice and be prudent with its words and deeds on matters relating to Hong Kong. Q: Bloomberg News reported that the US government has given approval to Taiwan's request to buy more than 60 F-16 fighter jets, according to people familiar with the matter. I wonder if you have any comment on that? A: China resolutely opposes US arms sales to Taiwan, and this position remains consistent and firm. We have lodged stern representations to the US. 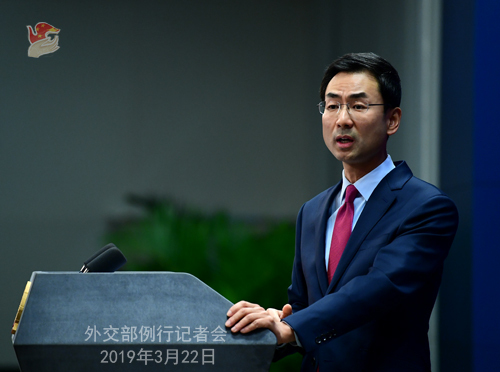 We urge the US to fully recognize the highly sensitive and harmful nature of the relevant issue, abide by the one-China principle and the three China-US joint communiqués, especially the August 17 communiqué, to stop arms sales to and military contact with Taiwan, and carefully and prudently handle the Taiwan-related issues lest it should seriously damage the cooperation between China and the US in important areas and the peace and stability across the Taiwan Straits. 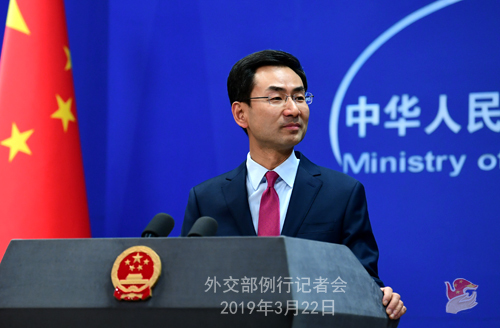 Q: According to reports, the Japanese Foreign Ministry has lodged representations to China because of its exploration of the gas field in the East China Sea. I wonder if you have any comment on that? A: China's oil and gas activities in the East China Sea are carried out in the undisputed waters under China's jurisdiction, and are entirely within the scope of China's sovereign rights and jurisdiction. In addition, the so-called "median line" is only a unilateral claim by the Japanese side. The Chinese side resolutely opposes it and has never recognized it. Q: I just got this news. This afternoon the DPRK unilaterally withdrew from the Inter-Korean Liaison Office located in Gaeseong area. What is China's reaction on this move? A: I haven't seen the news you said and need to check on that. With the concerted efforts of all parties, the current situation on the Korean Peninsula remains stable. We encourage all parties concerned to continue to engage in contact and dialogues, meet each other half way and advance denuclearization and the establishment of a peace mechanism on the peninsula. Q: The explosion in Jiangsu Province has caused great casualties. I wonder if you have any information about any foreign citizens wounded or killed? A: I have no information regarding what you asked about and I will try to check that for you later.